Out of a wintry wood, a redheaded young man appears and rushes toward the camera. Introducing himself, he says, "I'm The Martian Chronicles, by Ray Bradbury." This classic in-joke comes in the final scene of François Truffaut's 1966 film version of Bradbury's novel Fahrenheit 451. The speaker is one of the "book people," a group who, in a future age when books are burned by the government, have sequestered themselves in the countryside to commit the key works of Western and Eastern civilizations to memory. As we watch them pace the forest, stoically reciting prose to no one in particular, their commitment seems at first like a kind of literary self-immolation (not unlike the actual self-immolation that occurs earlier in the film, when an old lady lights a match so that she is consumed along with her favorite books). After all, who would want to remember only one book? Perhaps the Martian Chronicles fellow appears cheerful because his book is such a winning entertainment that entering into a monogamous relationship with it does not seem so onerous. When Bradbury died last month at the age of 91, a great deal of the commentary was about how prolific he was. In addition to the countless short stories, there are 11 novels, of which The Martian Chronicles and Fahrenheit 451 are only the most famous. Because he wrote so much, it is easy to forget how often he was filmed. His stories turned up on shows like Alfred Hitchcock Presents, Playhouse 90, and The Twilight Zone, among others, resulting in classic episodes such as "The Jar" (on Hitchcock), which was brilliantly adapted by the future writer-director James Bridges. In the '80s, The Martian Chronicles was given its own miniseries, and Bradbury himself emceed a respectable anthology series, The Ray Bradbury Theater, later that decade. There is an irony in all of this filming since Bradbury was a self-confessed Luddite. And there is an even greater irony in Truffaut's film being the best of the Bradbury screen adaptations. Of all his work, Fahrenheit 451 has the most explicit built-in hostility toward images, and Truffaut, in his fidelity to Bradbury, refuses to shrink from it. In a time without books, something has to take their place, and that something is television. As evidenced by the gaps in memory and perception suffered by Linda (Julie Christie), a housewife who whiles away the days entranced by a wall-screen hanging in her living room (would the sight strike anyone today as being from a science fiction movie? ), its effects on the human psyche are profoundly deleterious. Truffaut emptied the streets of people, Bradbury said in an interview, "because he wanted to suggest that everyone was inside—watching television." When Linda's husband, the book-burning fireman Montag (Oskar Werner), presses her, Linda cannot remember how they first met, yet she gullibly believes that she is a participant in the soap opera-like drama she watches with a religious fervor. But Fahrenheit 451 reformulates Martin Luther's sola scriptura into something like sola imago. No one who has seen the film can forget the black comedy of Montag sitting down in bed (Linda at his side, filing her nails after an evening spent beside the tube) to read the funny papers. A series of tighter shots confirm our suspicions: the bright illustrations are missing word balloons. In a sense, the entire film feels like one of those action-packed, dialogue-less comic panels: think of the racing red fire engine on which Montag rides or the swift destruction the firemen are capable of as they raid apartments searching for books. Everyone is moving at double speed, with little time to talk. 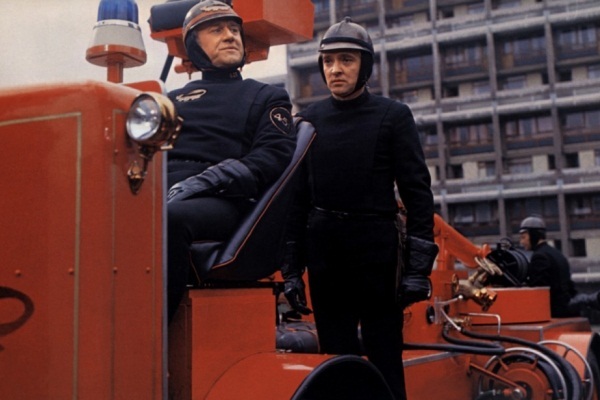 "Keep them busy and you keep them happy," says Montag's boss, the captain of the firemen played by Cyril Cusack, yet the people in Fahrenheit 451 seem more wolfish than content. The two teenagers on the opposite ends of a zooming monorail car who eye each other lustily, or the elderly woman who strokes her fur coat as though it were her best friend, look to be coarsened by their illiteracy. There is a polymorphous perversity to this world, but we should remember that Truffaut is not wholly opposed to regarding objects as friends. When books (as opposed to fur coats) are glimpsed in the film, they are lingered on, even when their pages are being burned. It is no wonder that the director who would later open his film of Henri-Pierre Roché's Les deux Anglaises et le continent with shots of the novel was drawn to Fahrenheit 451. When Montag, curious about the books he is burning, cracks the spine of David Copperfield for the first time, Truffaut savors every detail, as Montag runs his finger across the lines on the thin, almost translucent paper, and we read along with him. The books in Fahrenheit 451 are all old books (since new ones are no longer printed), which Bradbury, in an appreciative mood, once said smell "like ancient Egypt." Drenched in splashes of red, Fahrenheit 451 looks a lot like Truffaut's answer to Jean-Luc Godard's Made in U.S.A., released the same year and also infused with primary colors. Nicolas Roeg's photography here is as eye-catching as Raoul Coutard's in Made in U.S.A., not to mention Roeg's own work in Petulia or Performance, but in most other ways, the film is animated by a sensibility far removed from the freewheeling '60s. The use of real English locations, such as the endearingly run-down Tudor house where Montag's book-loving friend Clarisse (Christie) lives, palpably suggests an earlier era. The sentiment is reinforced when Clarisse, spotting an old rocking chair in her basement, reflects, "People used to sit outside their houses on warm evenings and rock backwards and forwards, talking to anyone who happened to be passing by." (One is reminded of Bradbury's rebuke in his 2005 book Bradbury Speaks: Too Soon From the Cave, Too Far From the Stars: "Turn off everything. Patrol your house to pull the plugs on the TV, the radio, the fax, the e-mail transmitting computer and its ingrown Internet. Go sit on your porch with a glass of vodka lemonade, a pad and pencil, and truly think.") When books go missing, Bradbury suggests, so do other good things. Many of those good things are seen (and relished) firsthand in the other major Bradbury film, the 1983 Disney production of Something Wicked This Way Comes, directed by Jack Clayton. The film is a kind of pastorale, with the small village of Green Town, Illinois, bordered by thickets of autumn-leafed trees and fields filled with pumpkins. (The time of the story is October, "a special month for boys," the narrator says.) Clayton, a British-born director heartily embracing Bradbury's unashamed Americana, gives us a cigar-store Indian; a barber's red, white, and blue-striped pole; and a set of roaring lions sitting on a library's steps, but, significantly, no movie palace. 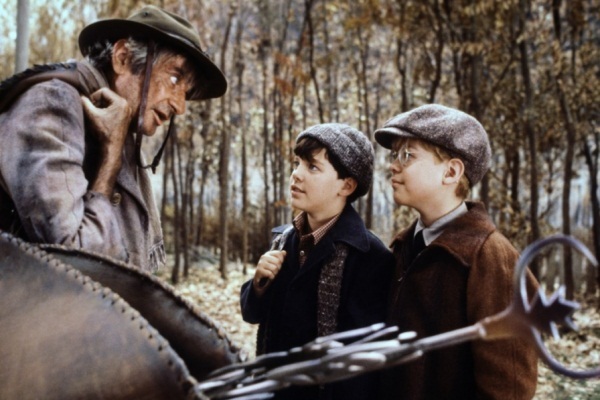 The hero of the story, librarian Mr. Halloway (Jason Robards), entices his son Will (Vidal Peterson) and Will's friend Jim (Shawn Carson) with a description of One Thousand and One Nights, not tickets to see Charlie Chaplin or Errol Flynn. Yet Bradbury is not tone deaf to the dissatisfactions in his earthly paradise. As the film opens, a scruffy lightning rod salesman (Royal Dano) warns of a storm blowing into town, but it seems to carry with it discontent rather than rain. A bartender who lost an arm and a leg in the war longs for his days as a football star, while sad Mr. Halloway moons over encroaching old age. For a film intended for children, there are moments of extraordinary matrimonial intimacy between Mr. Halloway and his wife (Ellen Geer), none more candid than the conversation they have one night after Will has gone to sleep. They sit on their bed, cradling each other as she unbraids her hair, and he wonders what sort of father he is for not being able to play baseball with his son. "Baseball is not necessary—not with a heart like yours. He'll forgive you that," she reassures him, but he confesses that he still feels restless. "Must be a storm comin'," he says, unpersuasively. The quietness of their unhappiness is haunting. Later that same evening, Mr. Halloway and Will share a painful memory, punctuated by the clock striking three, which Mr. Halloway refers to as "the soul's midnight." Even when the rest of the cast of Something Wicked This Way Comes seems adrift (the two young leads are sometimes a beat off in their line readings), Robards offers a grave, defeated presence that commands attention. The frankness of Mr. Halloway's longings undercuts the Eden that Clayton has so carefully re-created. In the end, however, we know that the virtues of Green Town will prevail over the forces that threaten it. The dastardly Mr. Dark (Jonathan Pryce) and his traveling carnival offer instant wish fulfillment for Green Town's mildly depressed, but Clayton invests their fantasies with scant glamour. Yes, the homely schoolteacher Miss Foley is transformed into a blushing beauty, but she can delight in her image for only a few seconds before she turns blind. 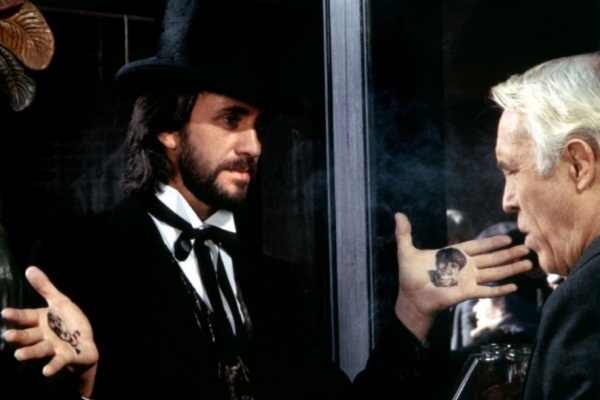 Despite the film's problematic post-production (Bradbury reportedly supervised reshoots following preview screenings), there is wit and economy in the way the editing contrasts its visions of good and evil. Late in the film, Clayton dissolves from a shot of the Halloways in church, intently singing the sturdy old hymn "Now, When the Dusky Shades of Night," to one of Mr. Dark, leading a parade in search of Will and Jim (who know what he is up to). Before Mr. Dark's appearance, Mr. Halloway sensibly admonishes a town barber against dreaming of exotic women: "You have to make do with the ladies we have here, Mr. Crosetti." And by the end, Mr. Halloway himself has accepted aging: for him, "being old was all right now," the narrator says. In a way, the moral of Something Wicked This Way Comes is not very far from that of Fahrenheit 451. In the earlier film, it is often said that the reason books must be destroyed is because they trouble people with the complicated, conflicting emotions they evoke. But Bradbury would surely agree with Truffaut's compatriot Godard, who so famously quoted Faulkner in Breathless: "Between grief and nothing I will take grief." So, in Something Wicked This Way Comes, an ordinary life of modest pleasures and persistent grievances comes at a lesser cost than one of too easy rewards. Seeing these two great Bradbury films back-to-back prompts certain questions. Is there such a difference between a wall-screen and a carnival if they both promise everything? Are they not each gods that failed? Fahrenheit 451 and Something Wicked This Way Comes will be shown as a Film Comment Double Feature at the Film Society of Lincoln Center on October 23, 2012. Peter Tonguette is the author of The Films of James Bridges and Orson Welles Remembered. He is presently writing a critical study of Peter Bogdanovich for the University Press of Kentucky and editing a collection of interviews with Bogdanovich for the University Press of Mississippi.